TRAFFORD, United Kingdom - The relocation of the famous ITV Coronation Street lot, from Manchester’s Quay Street Studios to the 7.7-acre studio and production facility on the Trafford side of MediaCityUK, has coincided with a significant streamlining of technology. Set in a fictional town in the north of England, what has become the world's longest-running television soap opera is a British ‘institution’, having first been broadcast back in December 1960. One of the biggest upgrades in this latest development has been the transition from an analogue mixing environment to a HARMAN Studer digital platform, once ITV had learnt that its familiar analogue surface would no longer be supported. With AVC Electronics appointed project consultants and TSL tendering successfully for the installation contract, Coronation Street’s head of sound, Alan Monks and Coronation Street technical manager, Stan Robinson, researched the market for suitable options. 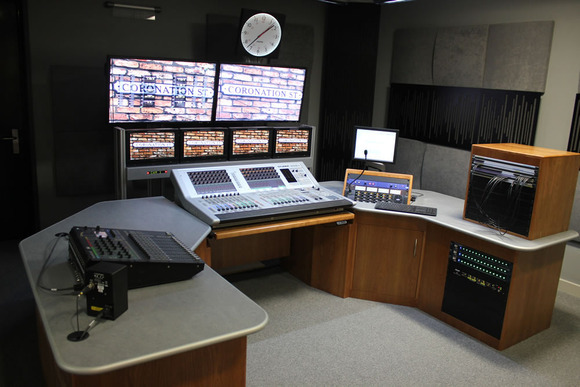 But it was the show’s senior sound supervisor, Mark Cochran, who suggested investigating Studer Vista 1 all-in-one desk for each of its two new production galleries. These were duly adopted, along with Compact Stageboxes and a Soundcraft Si Compact 16 mixing desk from Studer’s sister company Soundcraft, to provide resilience. When the order was placed by TSL, the Vista 1 became the first Studer sale to an ITV facility. The 22-fader Studer Vista 1, containing 20 channel stripsand twogrand master faders, provides Coronation Street with true broadcast monitoring, talkback, red light control and eight general-purpose control inputs/outputs (GPIO). But aside from ease of use and intuitive Vistonics™ interface, one of the key reasons for choosing Studer was the superior mic preamp — an observation made after the technical team had carried out comparison tests with their own alternatives. Stan Robinson admits that the Studer D21m mic input card, transformer balanced to all five stageboxes, had been a key driver, with Studer stageboxes transporting native MADI over an Optocore system. He added, “We didn't like the multi-layered menu of other desks — this was a lot easier. Also it needed to be intuitive because we have a small core of technical staff and a lot of freelance engineers using the system. It has been extremely well received.” Once a mic is plugged into appropriate input the source immediately appears on the relevant fader in the sound control room. This digital format has allowed Stan Robinson to introduce a unique fibre transportation system for the signals around the site. Based on the Optocore network structure, the portable stageboxes allow signals from the studios (or anywhere else on the site) to be routed to either gallery. Each gallery has its own stagebox, which production simply wheels to where shooting is taking place, and plugs in to the SMPTE 311M hybrid camera cable network — with 100 SMPTE sockets distributed around the site that can be patched in. Signals such as microphones, foldback, picture monitoring, video router control and talkback are automatically routed to the Studio Floor and Galleries. “In effect, the whole site becomes our studio floor,” says Stan Robinson.